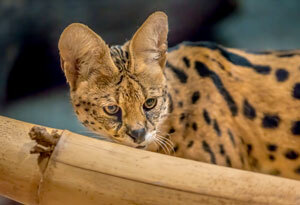 The Zoo is pleased to welcome Amos, a 9-year-old serval, to the family. Amos arrived from the Little Rock Zoo in Arkansas. The Milwaukee County Zoo has not displayed serval since 1993. Amos weighs approximately 33 pounds and zookeepers report his favorite treat is mice. He is housed individually in the indoor exhibit that formerly housed cheetahs and then caracal. He is on exhibit regularly in the Florence Mila Borchert Big Cat Country. Amos has a very sassy personality and will sometimes hiss at his keepers when they are nearby. He’s not afraid of water and often pounces on bubbling water as his basin is filling. For enrichment, Amos enjoys different herb and spice scents. Cinnamon is one of his favorite scents. The serval is a medium-sized cat species with 19 recognized subspecies. The serval is commonly found throughout the savannas of Africa, and is able to jump up to 10 feet in the air. Serval prefer areas where there is plenty of water and bushy grass. Servals are known for their distinct large and round ears. They are listed by the IUCN (International Union for the Conservation of Nature) in the least concern from becoming extinct category, with population sizes remaining stable. However, serval are threatened by habitat loss and hunting for their fur. Stop by the Big Cat building to give Amos the serval a warm welcome!